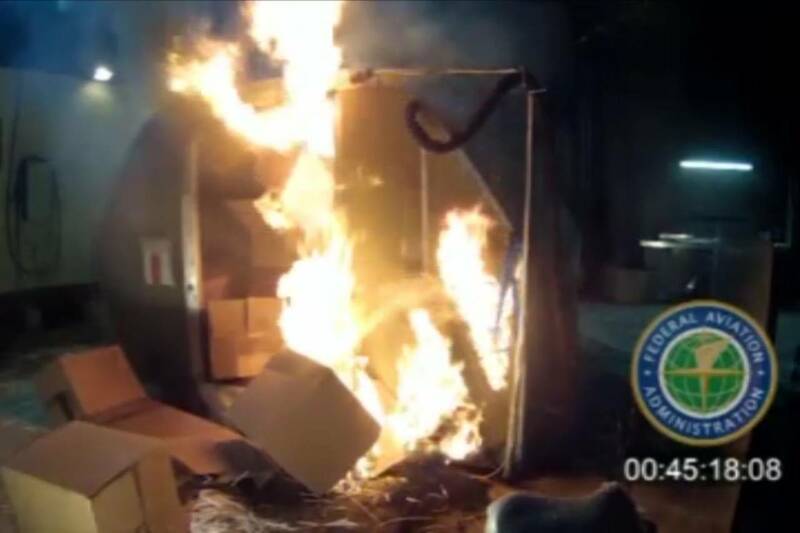 A frame grab from a video shows a test at the FAA's technical center in Atlantic City, N.J., last April, where a cargo container was packed with 5,000 rechargeable lithium-ion batteries. Lithium batteries, packed tightly together, can overheat or catch fire if they are damaged or experience short circuits. International air-safety experts this week will consider proposals to restrict lithium batteries carried as cargo by commercial jets, a sign that momentum is building for a ban on some of the most common types of shipments. Meeting in Montreal under the auspices of the United Nations, more than two dozen industry and government experts are set to debate options including temporarily keeping bulk shipments of rechargeable lithium-ion batteries off of all passenger aircraft until enhanced packaging requirements and other protections are in place. Lithium batteries, packed tightly together, can overheat or catch fire if they are damaged or experience short circuits. They have been implicated in intense, quickly spreading fires that brought down two jumbo freighters-and ravaged another big cargo jet on the ground-during the past nine years. Unlike earlier meetings of the same group of experts, this time Boeing Co., Airbus Group NV and other plane makers in principle support such a suspension, amounting to a major tightening of current global shipping standards developed by the International Civil Aviation Organization, a U.N. agency. Other pending proposals are less restrictive, though they still could end up imposing procedural changes and enhanced safeguards on a fast-growing global battery industry that churns out billions of cells annually and generates an estimated $12 billion in revenue from rechargeable batteries alone. The outcome of this week's deliberations, though, is uncertain, according to participants and observers familiar with the details. Industry representatives are split in their positions and it isn't clear how far the advisory panel is willing to go to crack down on such airborne cargo. But outside pressures have changed since last year, when ICAO took the unprecedented step of prohibiting lithium-metal batteries from being carried as cargo by any passenger jet. Such batteries carry a one-time charge and are often used in toys and cameras. Now, plane makers are focused on possibly suspending passenger jets from accepting certain bulk shipments of rechargeable lithium-ion batteries-ubiquitous power sources found in cellphones, laptops and myriad other consumer electronics. The manufacturers have joined pilot union leaders in arguing that existing jetliners weren't designed or built to withstand the high temperatures or explosive gases that also can result from fires involving lithium-ion power cells. Recent Federal Aviation Administration laboratory tests-which haven't yet been publicly released-indicate that lithium battery blazes are more prone to end in hazardous explosions or to reignite than scientists previously believed, according to one person briefed on the details. In their latest submission, an umbrella group representing aircraft makers told ICAO that current cargo fire-protection systems "are unable to suppress or extinguish a fire involving significant quantities of lithium batteries." As a result, flying such batteries as cargo poses "an unacceptable risk to the air transport industry," according to the paper submitted by the International Coordination Council for Aerospace Industry Association. The association advocates "immediate action" to reduce risks, by temporarily halting all cargo shipments of "high-density packages of lithium-ion batteries and cells" on passenger jets until "safer methods of transport are established and followed." The "tide is definitely turning, since we have these recommendations from the manufacturers," according to another participant in the upcoming session. But so far, this person emphasized, there is no consensus on many big-ticket items. Still unresolved are sweeping recommendations from last fall including proposals to insert gels or other types of cooling agents between batteries or power packs, as a way to prevent rapid spread of heat and flames. A recent position paper submitted to ICAO by the Rechargeable Battery Association, a leading industry trade group, opposes proposals to sharply reduce the level of electrical charge inside lithium-ion batteries slated for airborne shipments. That would be one more way to reduce flammability and seek to prevent explosions. The battery group, among other things, objected to shipping batteries with as little as 30% of maximum charge, arguing that 55% or so was necessary to avoid potential technical problems, ensure adequate shelf life and meet customer demands. Battery experts estimate more than 5 billion lithium-ion cells were produced globally in 2014, with original manufacturers likely shipping at least 550 million of them by air. The battery association's technical paper also asserted that the FAA's tests aren't relevant to gauge real-world battery behavior. But in a conciliatory section, the association said that since ICAO decisions "could have a profound and long-term impact on lithium-ion cell and battery manufacturers," affected companies "would welcome the opportunity to work with" the agency and plane makers to find solutions. This week's meeting comes as prominent airlines world-wide increasingly are embracing voluntary restrictions on lithium battery cargo shipments. United Continental Holdings Inc., Delta Air Lines Inc., Qantas Airways Ltd. and Air France-KLM are among the carriers that have stopped putting any lithium batteries in cargo holds of their passenger planes. Earlier this month, Hong Kong-based Cathay Pacific Airways Ltd., a major transporter of lithium batteries coming from Chinese factories, decided to stop such shipments on all of its planes. Other issues slated to be considered at the meeting include the maximum number of loose lithium batteries that can packaged together under today's standards; and whether smaller, so-called button batteries, often used for medical and other specialty devices, should be exempt from general shipping restrictions. The working group also plans to reassess ICAO's guidance to help cabin crews react to smoldering or dangerously overheating batteries inside electronic devices passengers bring into the cabin. Up to now, experts have advised flight attendants to avoid moving such items until they are doused in water and completely cool down. But proponents of some recent studies and new fire-suppression technologies are urging international and national regulators to allow burning devices to be placed inside specially designed protective sleeves as soon as a problem is discovered. RIYADH, April 27 (Bernama) -- A Saudi pilot and a trainee were killed when their military plane crashed during a training mission, the defense ministry said Sunday. The ministry did not say where the plane had crashed, Xinhua news agency reported. The plane belonged to the King Faisal Air Academy military flight school in capital Riyadh. In February, four crew members died when a military chopper crashed in Hafar al-Batin city during training. A Tornado fighter carrying royal air forces in 2013 crashed but crew members managed to escape to safety. RICHMOND, VA (WWBT) - A passenger's lithium battery sent smoke into the cabin of an American Airlines jet Saturday, moments after the regional aircraft landed at Richmond International Airport. A flight attendant on board American Airlines flight 4010 immediately used the cabin's fire extinguisher, as pilots requested emergency response teams to meet the jet on the tarmac. The flight departed Charlotte, N.C. at 11:04 a.m., and arrived in Richmond at 12:03 p.m.
As the plane touched down, a flight attendant reported smoke in the cabin, with the aircraft alerting air traffic control to the situation on the CRJ-200. The regional jet is operated by US Airways Express - Air Wisconsin, with 45 people on board, including two pilots and one flight attendant. After coming to a stop without further incident, passengers evacuated the plane on Taxiway B. Emergency response vehicles met the aircraft on the tarmac, with passengers bussed to the terminal. The flight attendant pinpointed the source of the smoke to a passenger carry-on bag, with no injuries reported from the smoke. The European Union Air Safety Assessment team has completed its technical study of seven airline companies in connection with the review of the European Union air safety list, Guy Ledoux, Ambassador of the Eiu top the Philippines said. He said the Aviation Authority of the Philippines (CAAP) and the seven airline companies were waiting for the result of the technical assessment of the team, which started their assessment from April 16 to 24. "It is clear that both the CAAP as well as the airlines, which were visited in the past 10 days, did a good job in cooperating in a transparent way with the EU aviation safety experts," Ledoux said. The European aviation safety experts looked into CAAP's safety oversight over the Philippine aviation industry and the safety situation in Philippine airlines companies. Results of the their assessment will be shared with CAAP and the airline companies. Capt. Richard Miller, aviation safety expert at the European Commission, led the EU safety experts. Aviation safety experts from the European Aviation Safety and several EU Member States assisted Miller. The airline companies involved in the study were Air Asia Inc., Air Asia Zest, Air Philippines Corporation, Island Aviation Inc., Magnum Air, South East Asian Airlines and South East Asian Airlines International Inc. The team's report will be an important element in future deliberations of the European Commission with the EU Air Safety Committee. The Committee, which meets twice a year, consists of top aviation safety experts of all of the EU Member States, and is chaired by the European Commission's Director for Aviation. The Committee provides the European Commission its opinion on the carriers of countries that are on the EU Air Safety List. On the basis of that opinion, the European Commission has the power to decide which airlines can be removed or added to the EU Air Safety List. The European Commission will update the Air Safety list in July and December this year. Ledoux thanked both CAAP as well as the airlines for the very cooperative and transparent way in which they had made it possible for the European aviation safety experts to conduct their work. "We are pleased with the key safety priorities of the CAAP which General Hotchkiss underlined at this closing meeting: Fairness, Integrity, Transparency and Accountability are indeed the best possible pillars for good aviation safety," Ledoux said. A Southwest Airlines flight traveling from Las Vegas to Milwaukee made an unscheduled stop in Denver Friday night after reporting pressurization issues. Southwest Flight 100, which departed Las Vegas at 6 p.m. PST, was diverted to Denver after about an hour and a half, DIA spokeswoman Laura Coale said. Emergency responders from the Denver Fire Department evaluated the passengers. "There were patients that requested medical attention, but only one person has been transported for care, and that was due to a slip and fall," Coale said. "All passengers have been evaluated. No more medical attention is required." Three days after Chile's Calbuco volcano first erupted, ash clouds forced flight cancellations Saturday in Chile, Argentina and Uruguay. Airborne ash particles, carried by wind across South America, can cause issues for plane engines, prompting the precautionary groundings. Calbuco erupted Wednesday and Thursday, shooting a plume of smoke and ash about 11 miles into the sky. The ash was blown across South America, Argentina seeing the brunt of the impact on flights since wind carried the ash northeast. Delta Airlines, Air France, American Airlines, Air Canada and Qantas Airways all suspended flights Saturday to and from airports in Santiago, Chile; Buenos Aires, Argentina, and Montevideo, Uruguay, Reuters reported. Buenos Aires, for context, is about 1,000 miles away from Calbuco. Chile's and Argentina's main airlines were both operating flights to and from those airports, however. "The situation is much better than yesterday," a spokesman for Argentina's National Civil Aeronautic Administration told Reuters. "The airports [of Buenos Aires] are operating normally. The first ash cloud has already passed by and the second is on the move. American Airlines is not operating on their own accord, nor are Delta Airlines or United. They are evaluating the situation on a day-to-day basis." The effects of the eruption have been wide-ranging. Authorities urged about 2,000 more people living nearby to evacuate Friday after about 1,500 were initially evacuated after the eruption. An increase in volcanic activity caused potentially deadly mud flows, or lahars, consisting of a mix of water and rock fragments, which can level anything in their path. The mudflows were detected in a river near the volcano. The area was first evacuated after the first eruption Wednesday, but people began returning Friday as the clouds of smoke and ash surrounding Calbuco lessened. Despite the lesser eruptions, it could be a while before the Calbuco finishes its first eruption in 45 years. "This is a complex [volcanic] process that could last for weeks," said Rodrigo Alvarez, head of Chile's mining and geological service, according to Reuters. Officials said the people newly evacuated from the towns of Chamiza, Lago Chapo and Correntoso would stay at shelters in Puerto Montt. "I'm worried about the lava because we're right below it all," said Jorge Vargas, a farmer who had to flee with his family, leaving behind his property and animals, according to Fox News Latino. "My children are very scared. They just want to go back home, but we can't because of the [volcanic] gases." The lahars are an added danger, along with the already devastating clouds of ash and dust. Some houses and schools have collapsed under the sheer weight of the ash. The volcano's eruptive process could perhaps last months, and a third eruption is possible, Alvarez said. Unless a third eruption comes, however, weather experts expect the clouds of ash to dissipate. Authorities said the official used his airport employee access card to bypass passenger security screening. A firearm was found in his carry-on luggage when he went to fly back to Atlanta, authorities said. Abbott said he had a permit to carry a gun, that he forgot he had it with him, and that it's his wife's. A former Federal Aviation Administration inspector from Sugar Hill, Ga., has pleaded not guilty to federal misdemeanor charges of carrying a loaded gun on a plane, Channel 2 Action News reported. Ernest Abbott, 69, said he had a Georgia permit to carry a gun, that he forgot he had it with him, and that it belonged to his wife, Channel 2 said. Abbott was charged with unlawfully possessing a firearm. He also has been charged with unlawfully entering Hartsfield-Jackson International Airport and getting on a plane while bypassing required passenger security screening. Authorities said Abbott flew from Atlanta to New York on Jan. 12, 2015. Prior to boarding his flight, authorities said, he used his Atlanta airport employee access card to bypass TSA screening. On Jan. 13 a firearm was detected in his carry-on luggage as he attempted to fly back to Atlanta, authorities said. Abbott has been ordered to appear in federal court in Atlanta on May 5, and he has a hearing in New York set for May 13, Channel 2 reported. ORLANDO, Fla. - An Atlanta-bound Southwest Airlines flight from Florida was delayed after the right wing of the plane clipped a truck on the tarmac. The Orlando Sentinel reports the jet was backing up Sunday along the Orlando International Airport tarmac when the wing of the aircraft hit a provisioning truck. Southwest Flight 1717 was scheduled to take off at 5:20 p.m., but was delayed over an hour after the incident. A Southwest spokesman says the plane only made "very light contact" with the truck. The flight was able to take off at 6:50 p.m. after the maintenance crew did a thorough inspection of the aircraft. There was no damage on the truck or plane. Gama Hutchinson, a new private jet venture between Hutchinson Whampoa China (HWCL) and London-listed Gama Aviation, is adding business aircraft management to a CK Hutchison Holdings' aviation operation that already spans aircraft maintenance to leasing. HWCL's managing director Simon To and Gama's chief executive Marwan Khalek said they were untroubled about entering the market at a time when austerity measures on the mainland have resulted in the slowest growth in its private jet fleet in years. "Even if we didn't have the anti-corruption campaign and everything, it wouldn't have grown at the pace people were expecting, because the problem in the region is the infrastructure is lacking, de-regulated airspace is lacking," said Khalek, who founded the global air and ground services company in 1983. Two client-owned Bombardier jets the joint venture will start operating from Hong Kong this month will bring Gama's managed fleet to 147 planes and introduce CKH Holdings to private aviation. "The market slowdown is only temporary," To said. "We believe private aviation has great potential, and it comes together well with the group's other aviation investments: we are already involved in aircraft maintenance in Hong Kong, in Guangzhou, and there is the aircraft leasing business" - HWCL's Guangzhou Aircraft Maintenance Engineering and China Aircraft Services (CASL) in Hong Kong. To said the venture would develop into a jet management and charter operator in the greater China region, and was looking to buy its own planes - a prerequisite for an air operator's certificate it is applying for. Khalek said adding 50 aircraft to its managed fleet in four or five years was "perfectly realistic" given the number of people who would need private aviation to buy them time in the world's second-largest economy. But he cautioned that the market's short-term growth profile was less clear than its long-term one, and that infrastructure - which is what private aviation fundamentally relies upon to be fast and convenient - was a real constraining factor. "For me it is not in question that the demand will be there ... I think the biggest unknown is at what pace that will happen," he said. "If the demand today here is unlimited, the industry wouldn't be able to meet it, because the infrastructure is dragging behind." A lack of policy direction was reinforcing the lack of investment in ground operation facilities on the mainland, he said, while Hong Kong's future as a business aviation hub was also capped without a third runway and more space for business aviation. Hong Kong Business Aviation Centre (HKBAC), currently the only handler for business jets at the airport, is notoriously overcrowded and expensive as the number of resident and visiting aircraft far exceeds its capacity. "We've told the Airport Authority we hope to have another HKBAC," To said. "But they are busy resolving all the third runway issues and it is not really on their agenda. "Before that happens, we'll just have to be competing against people here to get slots and space I guess ... but we have an advantage - CASL has its own hangar so we could park our planes there." x-47bThe Navy's unmanned fighter completed its first aerial refueling Wednesday, the first of the aircraft's final tests before it's retired to make way for the next generation of carrier-launched drones. The X-47B received over 4,000 lbs. of fuel from an Omega K-707 tanker aircraft, unmanned carrier aviation program manager Capt. Beau Duarte said, while flying off the coast of Maryland and Virginia from Naval Air Station Patuxent River, Maryland. It was a huge achievement for unmanned aviation, Duarte said in a Thursday news conference, as the first autonomous aerial refueling on the books. "The ability to autonomously transfer and receive fuel in flight will increase the range and flexibility of future unmanned aircraft platforms, ultimately extending carrier power projection," Capt. Beau Duarte said in a news release. The test was particularly complicated because the X-47B doesn't have a pilot to help maneuver to catch the tanker's fueling probe mid-air. The aircraft flies preset programs within its software, so an operator pushes a button to initiate the refueling process. Completing the test took a mix of those programs and sensors, including a differential GPS and an infrared camera. On Wednesday, X-47B vehicle 2 - also known as Salty Dog 502 - met up with the tanker in Pax River's restricted air space over the Chesapeake Bay, starting the program at 1,000 feet below the aircraft before closing distance using GPS. When the two aircraft were eight feet apart, Duarte said, the operator started the program for refueling, which extended the X-47B's fueling probe to meet up with the tanker's hose and drogue. "The computer was doing the work," Duarte said. "It was just the operator, from a test perspective, who was ensuring that safe and stable conditions were met at each step along the way before proceeding." The refueling Wednesday lasted over 11 minutes, he added, the fifth successful engagement of the two aircrafts' equipment over four days of testing. The refueling is the last in a series of tests the X-47B has carried out in recent years, including landings and takeoffs aboard an underway carrier and flying in the pattern with manned jets. The X-47B, which came out of the Unmanned Combat Air System Demonstration program, was never meant to be an operational aircraft, Duarte said. Now that its proven it can integrate into an aircraft carrier's operations, the X-47B will be retired to make way for the next aircraft, the Unmanned Carrier Launched Airborne Surveillance and Strike system, which is scheduled for operability in the early 2020s. "We will pull these concepts, some technologies and some methodologies that we have used to test these things directly into UCLASS, either updating performance specifications or system architecture," Duarte said. A strategic portfolio review is scheduled for this summer, to take what the UCAS-D program has learned and decide what should transfer to UCLASS and what needs to be done differently. For instance, Duarte said, UCLASS needs a more expeditious refueling system, that can operate in rough weather conditions and more quickly stabilize itself as it approaches a tanker. As for Salty Dog 501 and 502, the two aircraft Northrop Grumman built for the program, they'll likely end up in a museum or at the Navy's aircraft boneyard in Arizona. As officials testified before Congress during the fiscal year 2016 budget season, lawmakers pointed out that the X-47s have only used about 15 percent of their lifetime flying hours, suggesting that they be kept in the air to test further capabilities. Duarte has said that because the UCAS and the hypothetical UCLASS systems are so different, keeping X-47 flying might not be helpful to its successor's development. And, as far as turning the aircraft into something more UCLASS-like to keep testing it, there's a conflict of interest. Because Northrop Grumman will be one of the contractors competing for the Navy's UCLASS business, to give its existing aircraft an edge would taint the process. For now, Duarte's office is looking at several options, "ranging from museums to further potential operations either on the ground or in flight, but it's got to be cost-effective, and it's got to be something that keeps the playing field level for UCLASS." Panelists to include: Brendan Schulman, Special Counsel, Kramer, Levin, Naftalis and Frankel; Ketih Hagy, Director, Engineering and Air Safety, Airline Pilots Association; Jay Stanley, Senior Policy Analyst, ACLU Speech, Privacy and Technology Project; Loretta Alkalay, Former Regional Counsel at Federal Aviation Administration; and Moderator Douglas McQueen, Aviation Attorney, LeClair Ryan. Ramada Plaza Karachi, Pakistan (8th to 12th June, 2015). What you get - Participants will receive a consolidated reference binder of class material with CD and a certificate by IATA. Course Location Karachi -A shopper's paradise. The cheapest city of the world has a wide range of activities for visitors; eating out is a fun in Karachi. Shopping malls and traditional bazaars where you can buy carpets, wooden articles and leather products. Have client seeking to acquire two Mi-17's, manufactured 2004 and after.